OAK BROOK, IL, UNITED STATES, February 19, 2019 /EINPresswire.com/ -- Ultra Consultants, Inc., an independent research and enterprise solutions consulting firm serving the manufacturing and distribution industries, and Kestrel Management, a consulting firm that helps companies achieve food safety regulatory and certification standard requirements, join forces to present an educational webinar session Thursday, March 7, 2019 at 2PM ET. Experts from Ultra Consultants and Kestrel Management offer an educational webinar session taking place March 7, 2019 to learn what it takes to integrate compliance programs into core business processes and systems. 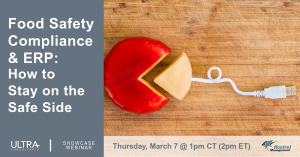 Set for Thursday March 7, 2019 2pm ET, the Showcase Webinar is entitled “Food Safety Compliance and ERP : How to Stay on the Safe Side.” The session details how to meet a pressing need – selecting and implementing the right technology to meet strict food safety mandates. •	Understand the key food safety trends and regulations impacting the sector. •	Get an overview of strategies to help meet and sustain food safety compliance, certifications and regulatory mandates. •	See the must-have ERP features to help reduce operational risks, achieve food safety requirements, and realize sustained value through effective use of enterprise technology. Ultra Consultants is an independent research and enterprise solutions consulting firm serving the manufacturing and distribution industries throughout North America, as well as companies with global operations. Since 1994, Ultra has delivered enterprise technology expertise and process management to drive business performance improvement for our clients. More information on the company's services, leadership, industry verticals served, and software vendor relationships can be found at www.ultraconsultants.com.